Delivers the thermal flux and the internal and external linear transmittance of thermal bridges with finite elements solver, shows the temperature distribution, the critical isotherm and verifies the formation of mold. Including all types of thermal bridge provided by the parametric abacus. 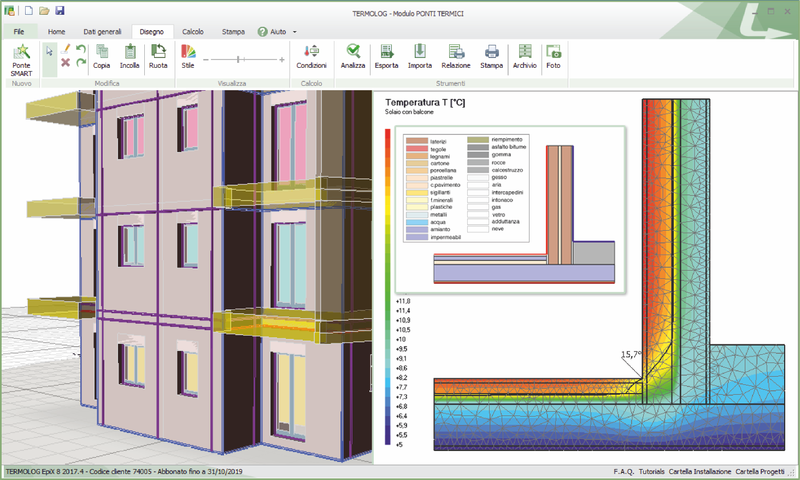 TERMOLOG delivers a powerful finite element solver to analyse the building thermal bridges. Use Modulo PONTI TERMICI FEM and choose between the accurate Finite Element Solver method and the rapid pre-calculated abacus. You can freely draw the thermal bridges by importing profiles and geometries from you CAD; or you can rely on the intuitive Wizard and select the most appropriate thermal bridge in the library. TERMOLOG creates the thermal bridge model ready for calculation with the right boundary conditions. It's easy to monitor results: TERMOLOG displays the temperature map, the critical isotherm and the thermal flow direction. You check nodes to prevent mold and define the surface resistance factor to comply with legal obligations.